What started as a traffic stop for speeding landed two people in jail and led to the recovery of four stolen vehicles. On Jan. 22, an officer assigned to the Gwinnett County Police Department’s Motorcycle Unit stopped a driver who was believed to be speeding. After making contact with the driver, the officer discovered that the license plate displayed on the back of the driver’s Jeep was stolen. The driver told the officer that she purchased the vehicle through an ad on a website. According to Gwinnett Police spokesman Michele Pihera, once the driver was arrested and placed in the backseat of a patrol car, the officers found that the VIN plate displayed in the windshield was fraudulent. The true VIN was found. As it turns out, the jeep was reported stolen from Thrifty Rental in Tennessee when someone rented the vehicle with fraudulent information. The driver of the jeep, 26-year-old Akhria T. Cooper was eventually taken to the Gwinnett County Jail. Investigators with the Motor Vehicle Theft Unit made contact with her boyfriend, 26-year-old Derrick L. Taylor-Canty, and informed him that his girlfriend was at the jail. Taylor-Canty traveled to the jail to bond out Cooper. Police say while in the parking lot, he called the investigator to inquire about his girlfriend. Suspecting that Derrick could also be in a stolen vehicle, the investigators confronted Derrick in the parking lot. According to Pihera, the 2019 Infiniti that he was driving also had a fraudulent VIN. The real VIN was found, and investigators learned that the vehicle was reported stolen from Enterprise Rental in Kentucky. Taylor-Canty was also arrested. Then, officers searched Taylor-Canty and found two more sets of keys on him. The officers went to the home of Cooper’s home in Duluth and found a 2013 Lexus with the license plate from the stolen Infiniti. Police report the Lexus also had a fraudulent VIN and was reported stolen through the Atlanta Police Department. The license plate to the stolen Jeep was found in the trunk of the Lexus. According to Pihera, investigators learned that Taylor-Canty had sold a 2008 Acura MDX to a buyer in Milton using the title to a different vehicle. The Acura was reported stolen from I-85 and Steve Reynolds Boulevard in August when the owner had been in a traffic accident and left the vehicle parked along the interstate. The vehicle was recovered Jan. 23.
Cooper was charged with: Theft by Receiving Stolen Property (Felony), Theft by Receiving Stolen Property (Misdemeanor), Altered Serial Numbers, Speeding, Driving without License, Acquiring License Plate to conceal identity, Improper Window Tint, and No Insurance. 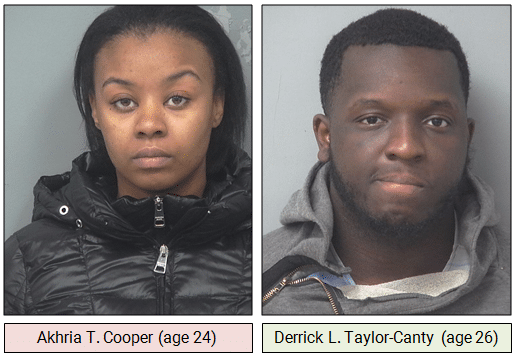 Taylor-Canty was charged with: Theft by Receiving Stolen Property (Felony) – two counts, Theft by Receiving Stolen Property (Misdemeanor), Altered Serial Numbers – two counts, Theft by Deception, and Operating a Chop Shop. Though this case resulted in the arrests of two individuals, the investigation is still active. Police say theyn have reason to believe there is a possibility that these two suspects may have victimized others and are asking anyone who may have purchased a vehicle from either Cooper or Taylor-Canty, to call 770-513-5285.